Poor medication adherence may increase rates of loss to follow-up, disease relapse and drug resistance for individuals with active tuberculosis (TB). While TB programmes have historically used directly observed therapy (DOT) to address adherence, concerns have been raised about the patient burden, ethical limitations, effectiveness in improving treatment outcomes and long-term feasibility of DOT for health systems. Digital adherence technologies (DATs)—which include feature phone–based and smartphone-based technologies, digital pillboxes and ingestible sensors—may facilitate more patient-centric approaches for monitoring adherence, though available data are limited. Depending on the specific technology, DATs may help to remind patients to take their medications, facilitate digital observation of pill-taking, compile dosing histories and triage patients based on their level of adherence, which can facilitate provision of individualised care by TB programmes to patients with varied levels of risk. Research is needed to understand whether DATs are acceptable to patients and healthcare providers, accurate for measuring adherence, effective in improving treatment outcomes and impactful in improving health system efficiency. In this article, we describe the landscape of DATs that are being used in research or clinical practice by TB programmes and highlight priorities for research. 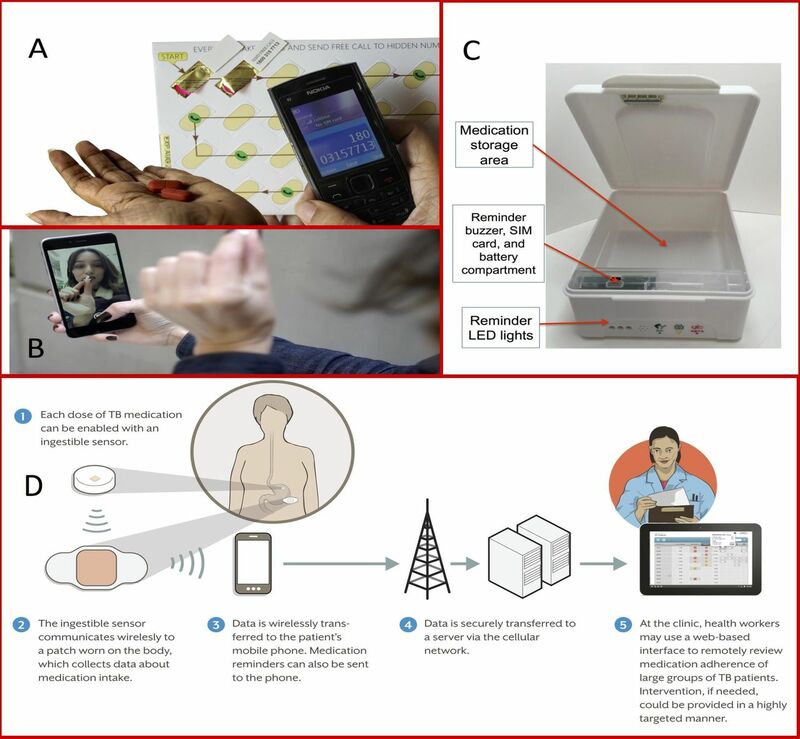 Digital adherence technologies (DATs)—which include feature phone–based and smartphone-based technologies, digital pillboxes and ingestible sensors—have the potential to facilitate more patient-centric approaches for monitoring tuberculosis (TB) medication adherence than existing directly observed therapy (DOT) models. DATs may serve a variety of functions in TB care, including reminding patients to take their medications, facilitating digital observation of pill-taking, compiling patient dosing histories and triaging patients based on their level of adherence, which can facilitate provision of individualised (‘differentiated’) care. Evidence that DATs improve TB treatment outcomes is limited, and more robust research is needed to understand the acceptability, accuracy, clinical effectiveness and cost-effectiveness of these technologies. DATs should be integrated with clinical strategies for identifying and addressing the underlying psychosocial, medical, structural and health system–related causes of medication non-adherence; otherwise, implementation of DATs may run the risk of overly focusing on ‘observation’ and replicating paternalistic aspects of existing DOT models. Tuberculosis (TB) is the leading infectious cause of death globally, even though most forms of TB are curable.1 The risks of death, disease relapse and acquired drug resistance increase with irregular adherence to TB therapy.2 3 Compared with drug-sensitive TB, drug-resistant strains require an extended duration of therapy with second-line or third-line drugs that are less effective, have higher rates of adverse effects and are more expensive. DATs may be particularly relevant for rethinking TB care delivery, for a few reasons. First, improving TB medication adherence may have public health benefits, such as reduced rates of disease relapse, acquired drug resistance and transmission of infection.2 3 Second, unlike other diseases for which self-administered therapy is the standard of care, many TB programmes globally currently use DOT for monitoring.22 While some TB programmes may view DATs as a challenge to their existing DOT models, in many contexts, DATs may provide an alternative for ‘observing’ medication adherence, potentially making them more acceptable to patients with TB and HCPs than they are for other diseases, as is discussed further below. Finally, unlike chronic diseases that require lifelong treatment (eg, hypertension), TB treatment has a defined duration, such that monitoring the entire treatment course with DATs may be feasible. While that previous systematic review described the existing evidence on use of DATs for TB, this current narrative review has a different goal. We use the findings of that prior systematic review as a starting point for describing the landscape of existing technologies that are currently being used and for highlighting critical gaps in research. Our review has been guided by a systematic search of the literature from 2000 to mid-2017 to ensure we cover the breadth of DATs currently being used in TB care (box 1). We first provide historical context for the use of DATs for TB and describe a conceptual framework that can inform their integration into clinical care. We then describe the variety of DATs that are being used for monitoring TB medication adherence and discuss key functions of DATs that have the potential to benefit patients and health systems. Finally, we highlight research priorities that could help to refine the testing and evaluation of DATs and create an evidence base to better understand their benefits and limitations for TB care. To better inform our narrative review, we searched PubMed for peer-reviewed articles published between 1 January 2000 and 31 July 2017, with the terms referring to tuberculosis (eg, ‘tuberculosis’ OR ‘TB’ OR ‘Mycobacterium tuberculosis’) and terms that refer to digital adherence technologies generally (eg, ‘adherence technology’ OR ‘mHealth’ OR ‘mobile technology’ OR ‘digital medication monitors’ OR ‘electronic monitors’ OR ‘remote observation’) as well as specific technologies (eg, ‘short messaging service’ or ‘cellphone’ or ‘smartphone’ or ‘digital pillboxes’ OR ‘electronic medication packaging’ OR ‘video DOT’ OR ‘ingestible sensors’). We only started our search after the year 2000 since these technologies are relatively new in the last 15 years. We selected case reports, qualitative studies, cohort studies, randomised trials and systematic reviews published in English. We also reviewed the references sections of these articles and sought advice from experts in the field to identify additional studies. We did not exclude any studies based on the methodology used or the study quality. We specifically excluded articles focused on technologies used to support medication adherence during treatement for latent TB infection. The idea of direct observation of medication ingestion for TB emerged in the 1950s and 1960s from studies in Hong Kong and India.25 Some of the perceived strengths of direct observation included close monitoring of adherence, face-to-face interactions between patients and HCPs, and careful documentation of treatment records. In 1991, the World Health Assembly adopted the ‘directly observed therapy, short-course’ (DOTS) strategy.22 DOTS is a multipronged intervention for which direct observation of therapy is just one component. DOTS also included use of ‘short-course’ therapy (ie, 6 months), use of smear microscopy for diagnosis and systematic reporting of treatment outcomes.22 While treatment success rates globally improved under DOTS,22 the extent to which these improvements can be attributed to direct observation of therapy versus other aspects of the DOTS package are unclear. We describe select DATs that are being used in research or clinical care for TB in table 1 and figure 1, along with details regarding SAT and DOT approaches for comparison. In SMS-based strategies, SMS texts remind patients to take medications; many approaches allow the patient to send a SMS response (ie, ‘two-way’) to indicate the dose has been taken. With 99DOTS, patients are issued TB medications in blister packs wrapped in a custom envelope. When a dose is dispensed, a hidden phone number is revealed on the inner envelope flap, prompting the patient to place a toll-free call to indicate a dose taken.34 In video DOT (VDOT), video conferencing via smartphone or computer allows HCPs to watch patients take medications, either synchronously (in real time) or asynchronously (at a different time using recorded video). Digital pillboxes have pre-programmed audiovisual reminders embedded in the pillbox. Opening and closing the box to access medications is recorded as a proxy for a dose taken. Ingestible sensors are microchips embedded in TB medications. Contact with a patient’s gastric fluid after ingestion results in transmission of a signal to an adhesive monitor worn by the patient. From there, the information is transmitted to the patient’s smartphone and then to a server, where HCPs can access dosing histories. Online supplementary appendix 1 provides more extensive details on each DAT. Below, we describe the key functions that DATs may perform in patient care (figure 2). Examples of different adherence monitoring technologies. (A) 99DOTS, a feature phone-based adherence technology (with permission from Everwell Health Solutions);87 (B) SureAdherence, a video DOT strategy (with permission from SureAdherence Mobile Technologies);53 (C) evriMED, a digital pillbox (with permission from the Wisepill Technologies);88 (D) an ingestible sensor–based adherence monitoring approach (Source: Belknap et al.37). DOT, directly observed therapy; LED, light-emitting diode; SIM, subscriber identification module; TB, tuberculosis. Functions that digital adherence technologies (DATs) can play to reinforce patient medication adherence and facilitate monitoring and triage of patients by health systems. ‘Differentiated care’ refers to providing different intensities and types of care based on a patient’s level of medication adherence as measured by the DAT. DATs provide reminders to patients, addressing forgetfulness, which is a common barrier to adherence.8 Forgetfulness is commonly thought of as a cognitive barrier to adherence, but it also reflects psychosocial and structural barriers faced by patients, such as forgetting doses due to alcohol use or working multiple jobs. Reminders may promote habit formation in pill-taking behaviour.15 32 For most DATs, reminders take the form of SMS texts. Digital pillboxes have embedded audiovisual reminders (eg, glowing light and ringing sound), which have the benefit of prompting patients to the site where medications are stored. Most DATs digitally ‘observe’ or record dose-taking, which is especially relevant in TB given the historical reliance on DOT. VDOT mimics DOT by allowing HCPs to view patients swallow pills. As with DOT, VDOT may raise concerns about patient autonomy—as patients may feel that being watched taking every dose is an invasion of privacy—although new technologies using automated facial recognition and pill identification could obviate the need for HCPs to watch every video.35 36 For some DATs, such as two-way SMS-based strategies, 99DOTS and VDOT, an extra step is needed to report dose-taking that requires effort by the patient herself, such as responding to an SMS text, placing a phone call or getting on a video call. For these technologies, dosing histories are compiled based on patient responses, and inaccuracies in the dosing history may be introduced because patients could send SMS responses or phone calls without taking doses (ie, over-reporting) or take doses without sending SMS responses or phone calls (ie, under-reporting). Digital pillboxes may minimise patient effort and the risk of HCPs accidentally mis-recording information on paper records because opening and closing the pillbox is digitally recorded as a ‘dose taken’. However, there are other potential limitations to their accuracy—for example, if a patient removes medication blister packs from the pillbox, allowing doses to be taken without opening it. Ingestible sensors record pill-taking with relatively high sensitivity and specificity37 38; however, removal of the adhesive monitor that records information transmitted by the ingested sensors would result in under-reporting of adherence. For all of these strategies, inaccuracy in patient reporting may be reduced by patient education about the purpose and appropriate use of these devices. Example of how digital adherence technologies involving daily reporting of dose-taking could potentially facilitate earlier identification and intervention to address medication non-adherence. The 99DOTS model is used for illustrative purposes. Each box represents a calendar day on the dashboard viewed by healthcare providers. Green boxes represent doses that were ‘called in’ on a given day and red boxes represent doses that were not called in. SMS, short messaging service. While DATs may help identify poor adherence, a careful clinical evaluation is needed to address its causes, which are often complex and may include psychosocial, treatment-related and health system–related barriers. As such, identification of non-adherence using DATs should ideally be viewed as the starting point for more intensive face-to-face engagement with patients to understand their specific reasons for non-adherence, so that individualised packages of care can be provided (ie, ‘differentiated care’). By triaging patients, HCPs may be able to spend more time on these high-risk patients to address their needs. Triage and differentiated care have the potential to focus limited resources on higher-risk patients, which may improve the efficiency of care delivery. In some settings, a more fundamental barrier to implementation of DATs may be health system resource constraints, such as lack of computers in clinics to view dosing histories and shortages of HCPs who could act on this information to address non-adherence in high-risk patients. Example of ‘technology fatigue’. 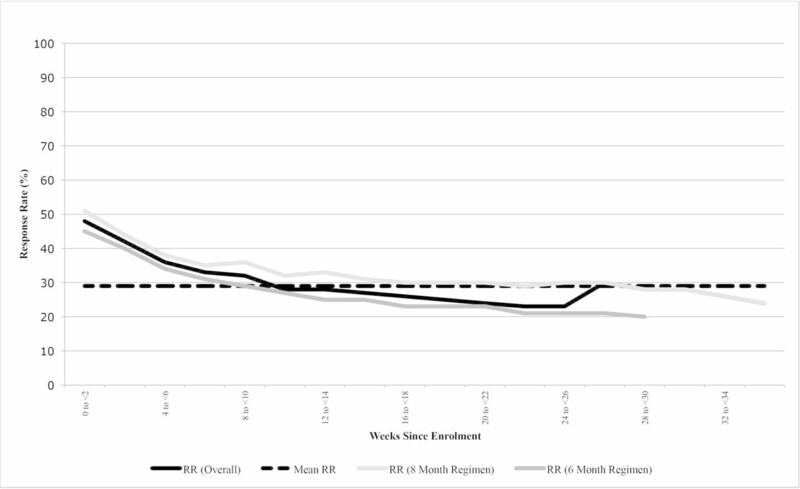 Patient response rates to short messaging service (SMS) texts to indicate dose ingestion declined throughout the course of tuberculosis therapy in a study of a two-way SMS intervention in Pakistan, reducing the accuracy of this monitoring approach. Source: Mohammed et al.68 RR, response rate. As such, evaluation of accuracy in research studies is critical to ensure that a DAT provides a reasonable proxy of true adherence. When conducting such research evaluations, careful use of nomenclature is important because it is easy to conflate the quality of a patient’s medication adherence with the quality of her engagement with the DAT, even though these two are not the same. Building on nomenclature recommendations for describing medication adherence,70 we suggest parallel nomenclature for describing a patient’s engagement with DATs (table 2). We recommend using multiple comparators to gain the fullest understanding of a DAT’s accuracy. For example, urine isoniazid testing provides a ‘snapshot’ of dose-taking that can be compared with DAT dosing histories over the prior 24–72 hours, while medication refills provide data on persistence with therapy that can be compared with longer-term dosing histories. Collecting biological test or pill count data during unannounced home visits (ie, without prior notice) may help to minimise the ‘Hawthorne effect’—that is, short-term changes in patient adherence or DAT engagement in anticipation of clinic visits.74 In patients concurrently taking medications for other comorbid conditions, such as HIV or diabetes, it is also important to assess the impact of a DAT on medication adherence for all conditions, if possible. Health outcomes—including medication adherence, treatment success and post-treatment recurrence free-survival—are the most important indicators of DATs’ impact on TB care (table 3, online supplementary appendix 1). When assessing health outcomes, especially in randomised trials or quasi-experimental studies, it is important to identify the appropriate comparator representing the baseline standard of care against which a DAT-based care model will be compared. In many settings, DAT-based models should be compared against DOT, recognising that DOT models may vary from setting to setting, including facility-based DOT, in-person DOT, and community or family DOT (table 1). In other settings, SAT may be the standard of care, though SAT models may also vary based on the frequency of patient–provider contact or medication refills (eg, biweekly, monthly etc). When DAT-based care models are compared against SAT models, we recommend that the SAT model should at minimum include a protocol for patient outreach and engagement if a patient misses a medication refill date since missing a refill may be suggestive of non-adherence. Comparing DAT-based models to SAT models that follow up on missed refills may reveal whether providing HCPs with more granular day-to-day real-time information from DATs (a proposed ‘value-add’ of some of these technologies) actually leads to better outcomes than a more crude but simple approach of following up promptly on patients who miss their medication refill dates. As such, we recommend that researchers initially focus on assessing whether DATs improve TB medication adherence. In settings where DATs transform care considerably (eg, shifting away from facility-based DOT), it is also important to routinely monitor treatment success rates to ensure that these outcomes remain comparable, at minimum. When evaluating treatment outcomes, it is important that the entire ‘package of care’ involving the DAT be well defined—including approaches for triaging patients based on dosing histories and the interventions that will be delivered to non-adherent patients. The study design used to evaluate health outcomes depends on the study goal and resources available. Cohort studies can evaluate whether health outcomes are achieving minimal standards recommended by TB programmes; however, this design is not optimal for understanding whether DATs themselves have contributed to improvements or deterioration in outcomes compared with prior standards of care. Historical programmatic data may be vulnerable to inaccuracy and provide a poor baseline for understanding the relative benefits of DATs. Quasi-experimental designs that evaluate outcomes prior to and after rollout of a DAT-based intervention may provide more helpful evidence regarding changes in outcomes; however, these findings may be confounded by other concurrent changes to TB care. Trials using randomisation of patients or larger units of care (eg, health facilities) to DAT-based interventions provide the most rigorous evidence of impact on health outcomes. Estimating an incremental cost-effectiveness ratio requires data on the difference in costs between the existing care model and a DAT-based model, as well as the difference in health outcomes between the two models, ideally represented as disability-adjusted life years. As such, costing studies should collect data on the costs of existing care models (eg, DOT or SAT), and concurrent studies estimating health outcomes for the different models would be required for a formal cost-effectiveness analysis. Modelling may be required to estimate the cost-effectiveness of DATs for TB programmes a national level.21 82 Cost-effectiveness of different DATs may vary between high-income countries (where personnel costs are high) and LMICs (where personnel costs are relatively low). Most DATs aim to identify non-adherent patients who may require additional support to improve adherence or prevent loss to follow-up. Poorly designed interventions for addressing non-adherence may therefore attenuate the beneficial impacts of DATs. HCPs might find themselves in a ‘data glut’, without the guidance or capacity to act productively on the rich real-time data compiled by DATs. A critical question hovering over DAT-based strategies is: how can the data-rich dosing histories compiled by DATs be best leveraged to provide effective individualised (or ‘differentiated’) care that will improve adherence? Addressing this question will require researchers and HCPs to think beyond the technologies to understand the medical, psychosocial, cultural, structural and health system barriers that contribute to non-adherence.7 Such research could inform the development (by iterative testing) of intervention packages targeted towards patients with different levels of risk for non-adherence. Examples of adherence intervention packages that leverage DAT dosing histories exist for other diseases, such as HIV.21 These packages of care could screen for and address common causes of non-adherence in each setting, which may include poor treatment literacy,84 TB medication toxicities,5 depression,5 85 86 substance use disorders,4 financial burdens7 or difficulties travelling to health facilities.7 By triaging patients, DATs may allow HCPs to focus more time and attention on a smaller group of high-risk patients, and ancillary personnel, such as dedicated counsellors or psychologists, could potentially help address their more intensive needs. To date, research evaluating triage and differentiated care strategies has been limited. DATs have the potential to transform TB care delivery by facilitating more patient-centric strategies for monitoring adherence, while providing HCPs with real-time data that can enable patient triage. The current DAT landscape includes a diverse array of technologies that are in development, undergoing pilot testing or being rolled out at scale as part of clinical care. 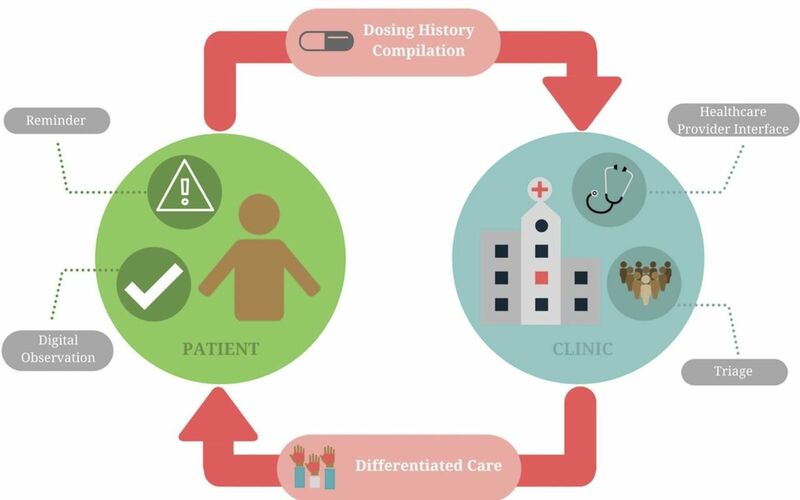 These DATs employ different devices, reminder functions and approaches for compiling dosing histories, which may contribute to differences in their acceptability, implementation costs and the financial resources required for rollout in different settings. As such, there is no ‘perfect’ DAT that will work optimally in every setting (especially high-income countries as compared with LMICs) or even for every patient in a single setting. Development of software platforms that can compile dosing histories from multiple DATs may allow HCPs to monitor TB patients who have varied needs using different technologies in the same setting. For example, in India, a single platform has been developed that compiles dosing histories from multiple DATs, which allows patients with cellphones to be monitored using 99DOTS while those without cellphones can be monitored using digital pillboxes. In addition, combining information from DAT-based strategies with data from non-DAT monitoring approaches in clinical practice—such as urine isoniazid testing or medication refill data—may be helpful in cases where patient engagement with the technology is suboptimal, resulting in inaccurate dosing histories. Research is needed to understand the impact of these technologies on patients and health systems and to inform approaches for provision of differentiated care. Outside of pilot data on VDOT67 and ingestible sensors37 38 in high-income settings and on digital pillboxes in China and South Africa,75 76 little is known about the accuracy of DATs for measuring adherence in patients with TB, especially with larger-scale implementation in LMICs and for patients concurrently taking medications for comorbid conditions such as HIV or diabetes. Most importantly, more robust data are required on DATs apart from two-way SMS to determine whether they have positive impacts on health outcomes, especially in high-TB-burden LMICs. Finally, while studies in TB have heavily focused on the DATs themselves, less emphasis has been placed on understanding how DATs can be leveraged to provide differentiated care to patients who require more intensive support to achieve optimal treatment outcomes. Little work has been conducted to understand the causes of medication non-adherence in different populations of patients with TB, so that clinical protocols can be designed to help HCPs screen for and address these causes. If the rollout of DATs also stimulates rethinking of the HCP–patient interaction, then DATs have the potential to move ‘care’ into non-traditional spaces (such as the home or the workplace) and to serve as an extension of the health system.32 Otherwise, DAT-based monitoring strategies run the risk of overly focusing on ‘observation’ and replicating some of the paternalistic aspects of existing DOT approaches. In our opinion, if DATs are viewed as tools for enhancing (rather than limiting) face-to-face human interactions, then they will have stronger potential for transforming TB care delivery by creating truly patient-centric models of care. We appreciate critical feedback on the manuscript from Bruce Thomas (The Arcady Group) as well as from the three anonymous reviewers for the journal. William Thies, Andrew Cross and Nakull Gupta (Everwell Health Solutions) provided cost data for 99DOTS and SMS strategies and a photo of 99DOTS and the 99DOTS dashboard for healthcare providers. Richard Garfein (University of California at San Diego) provided cost data and a photo of the SureAdherence Video DOT technology. Cost data for evriMED and Wisepill technologies and a photograph of the evriMED digital pillbox were obtained from Wisepill Technologies and Bruce Thomas (The Arcady Group). The corresponding author had access to all the data in the study and had final responsibility to submit for publication.
. Global tuberculosis report. Geneva: WHO, 2015.
. Predictors of relapse among pulmonary tuberculosis patients treated in a DOTS programme in South India. Int J Tuberc Lung Dis 2005;9:556–61.
. Cell phones in Africa. Communication Lifeline, 2015.
. Handbook for the use of digital technologies to support tuberculosis medication dherence. Geneva: WHO, 2017.
. 99DOTS: a low-cost approach to monitoring and improving medication adherence. Tenth international conference on information and communication technologies and development (ICTD 2019), Ahmedabad, India, 2019.
, 2017. LA county department of public health: monitoring treatment to tuberculosis disease and latent tuberculosis infection. https://aicure.com/clinical_evidence/using-aicure-to-meausure-and-support-tuberculosis-treatment-a-pilot-study/ (accessed 18 Oct 2017).
. Wirelessly observed therapy is accurate and confirms more TB medication doses than directly observed therapy. Guadalajara, Mexico: 48th Union World Conference on Lung Health, 2017.
. Ingestible drug adherence monitors: trending toward a surveillance society? Am J Bioeth 2015;15:1–2.
. Evaluation of the on cue compliance service pilot. South Africa Cape Town: Testing the use of SMS reminders in the treatment of Tuberculosis in Cape Town, 2005.
. Operational feasibility of medication monitors in monitoring treatment adherence among TB patients. Chin J Antituberculosis 2012;34:419–24.
. Self-verification and behavioral interventions via mobile phones drastically improves tuberculosis treatment success in a randomized control trial OA-136-12. Guadalajara, Mexico: 48th Union World Conference on Lung Health, 2017.
. Videophone utilization as an alternative to directly observed therapy for tuberculosis. Int J Tuberc Lung Dis 2010;14:779–81.
. Science and social justice: the lessons of HIV/AIDS activism in the struggle to eradicate tuberculosis. Int J Tuberc Lung Dis 2006;10:1312–7.
. 99DOTS: monitoring and improving TB medication adherence using mobile phones and augmented packaging OA-414-05. Cape Town, South Africa: Union World Conference on Lung Health, 2015.
. Monitoring and improving adherence to tuberculosis medications. In: Pai M , ed. Lets talk TB. 3rd edn. Mumbai, India: GP Clinics, 2017: 7–15.
. 99 DOTS Mini-Review. Int J Contemp Med Res 2016;3:2760–2.
. Using mHealth for HIV/TB treatment support in Lesotho: enhancing patient–provider communication in the START study. J Acquir Immune Defic Syndr 2017;1:S37–S43.
. Tuberculosis treatment with mobile-phone medication reminders in northern Thailand. Southeast Asian J Trop Med Public Health 2011;42:1444–51.
. Real time tuberculosis medication adherence intervention in rural southwestern Uganda. Uganda: Fogarty International Center, National Institutes of Health, 2017. Contributors RS, JH, AM and LdM conceived the report. RS, LdM, AM and JH wrote the first draft. LdM and RS conducted the literature search and designed the figures. KHM, MP, JH, BET and AM revised, edited and provided critical additions to the manuscript. All authors approved the final version. Funding RS is supported by a grant from the Bill and Melinda Gates Foundation via The Arcady Group (OPP1154665) and a Doris Duke Clinical Scientist Development Award. He acknowledges prior support for this work through a development award from the Harvard Center for AIDS Research (5P30AI060354-13) and a Harvard Catalyst KL2/CMERIT Award (KL2 TR001100). LdM was supported by a grant from the Harvard Center for AIDS Research (5P30AI060354-13). AM and JH are supported by an Emerging Global Leader Award from the Fogarty International Center (K43TW010388) and a mid-career development award from the National Institute of Mental Health (K24MH114732), respectively. BET conducted research on adherence technologies supported by the Bill & Melinda Gates Foundation (OPP1154670). MP holds a Canada Research Chair award from the Canadian Institutes of Health Research. Disclaimer The funding sources had no role in the conception, design, analysis or writing of the report, or in the decision to submit it for publication. Competing interests BET and RS are currently conducting research evaluating the implementation of 99DOTS and evriMED (a digital pillbox) in India, supported by the Bill and Melinda Gates Foundation; neither has any financial interest in these technologies. AM and JH are currently conducting research on the Wisepill device (a digital pillbox) in Uganda; neither has any financial interest in this technology. JH also consults for Merck and is also conducting research involving the use of evriMED1000 (a digital pillbox); she has no financial interest in this technology. KHM is providing mentorship for research evaluating the use of ingestible sensors; he does not have any financial interest in this technology. Data sharing statement This is a review article in which all studies described are available as published manuscripts or conference abstracts.